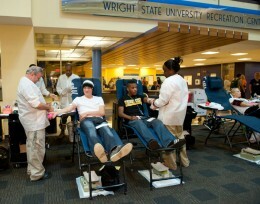 The Wright State community gave blood for veterans as part of Wright Commitment Day. (L-R) Sheldon Benson with the WPAFB Blood Donation Center draws blood from student Aaron Figley. To his right, student Kenneth McIntosh also gave blood with an assist from Sherita Goodwin from the Armed Services Blood Donation Program. Crayons for Classrooms, park maintenance and a blood drive for the armed forces. What do all of these things have in common? Students, staff and faculty from Wright State University chose between these activities and more on Thursday, September 8, as a part of the Wright Commitment, a community service project organized by The Office of Student Activities and the University Activities Board. Joseph Gibbons, philanthropy and collaborations chair for the University Activities Board, was instrumental in organizing the event. He is taking advantage of almost every opportunity offered during the Wright Commitment. Getting to know their peers is important for incoming freshmen, who may feel a little lost in their new environment. Gibbons says the Wright Commitment was a good first-week activity for them. Clean up and gardening efforts at several of the Five Rivers Metroparks, at 10 a.m. Sorting and delivery of school supplies for Dayton Crayons to Classrooms, at 2:30 p.m.
Volunteering at the Mary Queen of Peace Refugee Center, at 5:00 p.m. Since getting around Dayton might be an intimidating task for a new student—or for anyone—Jesse Iott, from the Office of Student Activities, said that organizers wanted to make service opportunities available to all students, staff and faculty, no matter their schedule, interests or abilities. Dayton RTA offered its services to Wright Commitment volunteers free of charge. RTA buses will provided transportation to and from each off-campus activity to anyone with a special Wright Commitment day pass. On September 9, during Fall Fest, RTA will set up a booth with pizza and prizes for anyone who has kept their Wright Commitment day pass. Depending on the success of the first Wright Commitment, Gibbons said he sees the Wright Commitment becoming not only an annual first-week event, but an event that recurs every quarter or semester. “Every quarter, I would like to do a philanthropy and community service event,” he said. The fall event will always be the biggest, but Gibbons wants to make community service a recurring option for students.